Today we catch up with one of underground dance music's leading ladies Jennifer Cardini. Primarily building her reputation behind the decks, as a resident at Rex Club in Paris she's been turning heads since the 1990s with high-energy selections from techno, minimal and nu-disco. Eventually adapting her night Correspondant into a record label in 2011. Dance music isn't where Jennifer's passion ends though, this year she launched new imprint Dischi Autunno with Noura Labbani for alternative music, drawing on her early influences Joy Division, Depeche Mode and Aphex Twin. 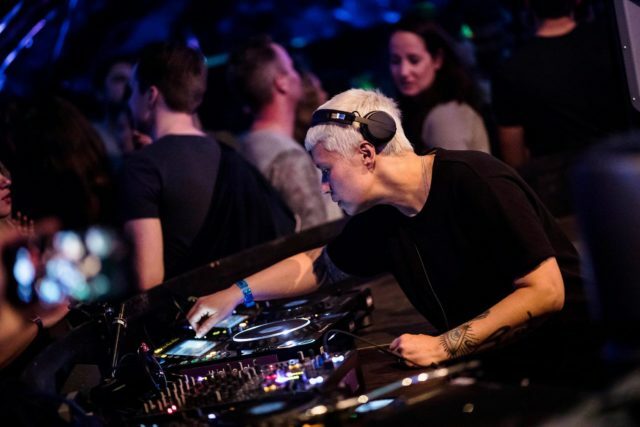 Now based in the German capital Berlin, Jennifer Cardini can certainly teach us all a thing or two about the fast-paced nightlife industry. Whether that's through her experience as an A&R for both her record labels or combatting the hedonistic lifestyle dance music typifies. Here she speaks candidly about her illustrious career that spans 20 years. Her recent bumping mix for Boiler Room below is the perfect accompaniment. Fresh from playing across the United States, next Tuesday she stops off at Mosaic for Maceo Plex's penultimate party of the season at Pacha Ibiza, alongside Modeselektor and Young Marco. You can also catch Jennifer in October at DGTL Tel Aviv, Rex Club, ADE with her own Correspondant crew and Life & Death, plus she'll make a glorious return to Panorama Bar. EARMILK: Dischi Autunno is a new imprint you began this year for home-listening music. What made you want to do this now? Jennifer Cardini: The only album that came out on Correspondant was Man Power’s beautiful self-titled album. We realized that the time was too short, between the album release date and the next releases. Correspondant put out music every month and even if we still release weird or slow music, it’s still very connected to my appetite for deviant dancefloor music. With Dischi Autunno we wanted to do the opposite – leave space in between releases and allow ourselves to experiment more. After releasing music from Red Axes, Die Wilde Jagd and Vox Low on Correspondant, we received more and more music from bands, most of the demos we got were albums or had the potential to become great albums so we thought it would be nice to have a separate home for that kind of music and format. Dischi Autunno is more of a ‘band’ label. We have a clear idea of what Dischi Autunno should be for the artists we sign and that’s what we are working on. A place where we take time and grow together. And I’m still buzzing that we released Dollkraut’s ‘Holy Ghost People’ as the first release, it’s such a great record. E: How do you divide your time listening to club music and non-dancefloor orientated sounds? J: I’m not sure I really think about that, I just listen to music, but let’s say generally two days in the week are fully dedicated to club music. The rest of the time it's music I like to listen to at home which is mainly non-dancefloor. E: You return to Ibiza in October for Maceo Plex’s residency, how will you prep for this set? J: As I’m cleaning up and reorganising my records at home, I will probably bring some classics with me, and some electro in case Maceo and I play back to back! We did it once at ADE and it was a lot of fun. I will for sure put a lot of attention in my selection as playing around closings is supposed to be really special. E: When did you first come to Ibiza and did it exceed your expectations? J: The very first time I played in Ibiza was for Circoloco at DC10. It was a long time ago, they had just started, maybe around 2000 or 2002. I don’t really recall thinking anything particular about the island at that time, of course, I knew about its glamorous years but like a lot of people I had the idea of it being a party island. At that time, Circoloco was the only place I would fit musically and I was not really interested in the rest of nightlife there as it was way too mainstream for my taste. It has changed so much since, musically. E: We caught your set at Circoloco last summer, a party you played again in June. Where else have you played on the island? J: I’ve only played Mosaic and Circoloco in Ibiza. It’s important to me to keep a family feeling when it comes to the island as so much is going on there. I’ve been playing Circoloco for a long time and even if I was not always a regular guest, I’ve always considered the Circoloco crew as family, probably because they were the very first one to bring me on the Island. My connection to Maceo Plex and Mosaic came later, I have been a longtime fan of Eric and I was really honoured when he invited my label to host the Prism room. What Maceo did last year was really daring, most of the artists he booked never played Ibiza before and I’m pretty sure that neither Dark Entries or us at Correspondant thought our labels would one day be part of Pacha’s programme. It’s really nice to see things changing. E: It’s hard to make a success of an Ibiza residency or to be discovered in general… What has been the biggest challenge in your career? J: I think one of the biggest was to realise that this was going to be my job! When I started to DJ I never thought it would be. I was very young and loved to party. At that time, we were only doing this out of passion without a plan, the scene was really new. My calendar became full of gigs but I would party hard every time – that got me into having to deal with addiction problems. When the scene grew and everything became more organised and structured, with jobs for bookers, managers and promoters, it became clear that it was now more than just playing records and partying. E: You’ve run your record label Correspondant for 6 years now. What do you wish someone told you before you started it up? J: Exactly what Michael Mayer told me when I called him and told him I wanted to start Correspondant: “Ok, let’s do it.” I do not regret one second I went for it. It’s a lot of work but I love it. E: Correspondant’s latest release ‘Compilation 05’ features some serious talent. How do you curate this series? J: It’s very connected to my DJ work. I get in touch when I like someone’s work. Most of the time I get to know about an artist via demos they send, promos I receive or simply by buying records. Some of the artists featured on the compilation are also full family members by now and are contributing to the series since nearly the first one too. So it’s always a mixture of new talents, friends and family members. E: Who have you got your eye/ears on next for Correspondant? J: Uriah Klapter and Javi Redondo will make their return to the label at the beginning of 2018, but before we will end the year in a bang! Zombies in Miami will make a return in September with their EP Take Control, it features great remix work from Benedikt Frey and Simple Symmetry. Cologne talent Julian Stetter is joining the label for a first EP and Yovav who was part of the two-last compilation will present his two first releases. It took some time to get those two EPs ready, to get all the remixes etc, so we are super thrilled to finally be able to share them.We have a lot planned on both labels and I’m really excited to share all the work Noura and I did in the last six months.